Victory by Valor. 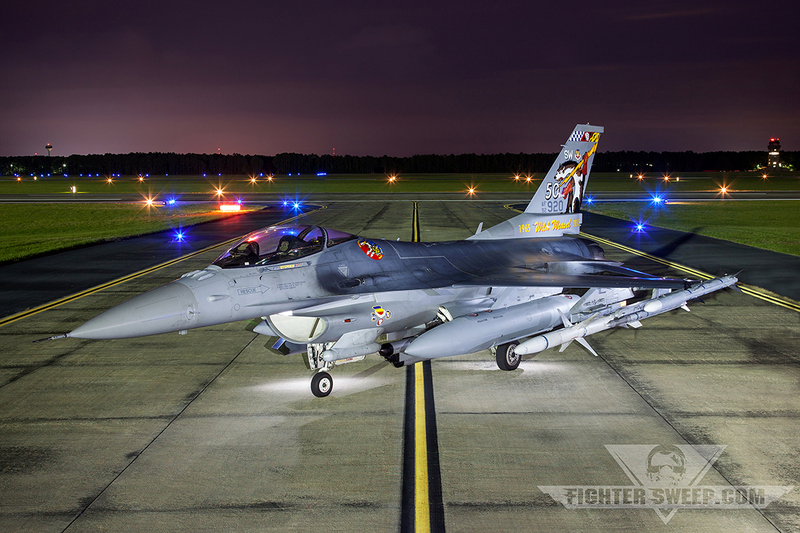 It’s the motto of Air Combat Command’s 20th Fighter Wing, located at Shaw Air Force Base in Sumter, South Carolina, and it’s especially fitting given the wing’s specialty – the Suppression and Destruction of Enemy Air Defenses (SEAD/DEAD), also known as the “Wild Weasel” mission. 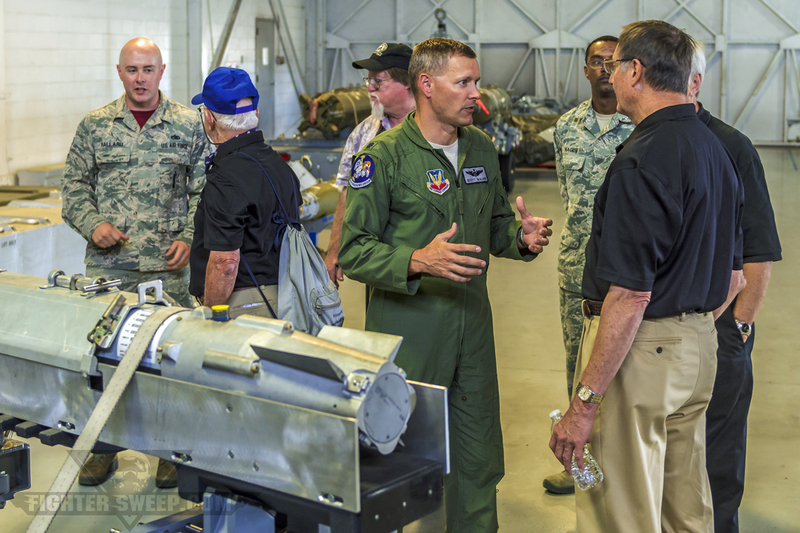 With the Wild Weasel community celebrating its 50th anniversary this year, the 20th Fighter Wing and its leadership have taken up the reins as the largest SEAD base within the Combat Air Forces, and during the first weekend in June, Shaw AFB hosted the Wild Weasel Tactics Conference. This event gave retired Weasel pilots and EWOs from the Vietnam and Desert Storm eras an inside look at current SEAD tactics and the platform executing the mission, the Lockheed-Martin Block 50/52 F-16. 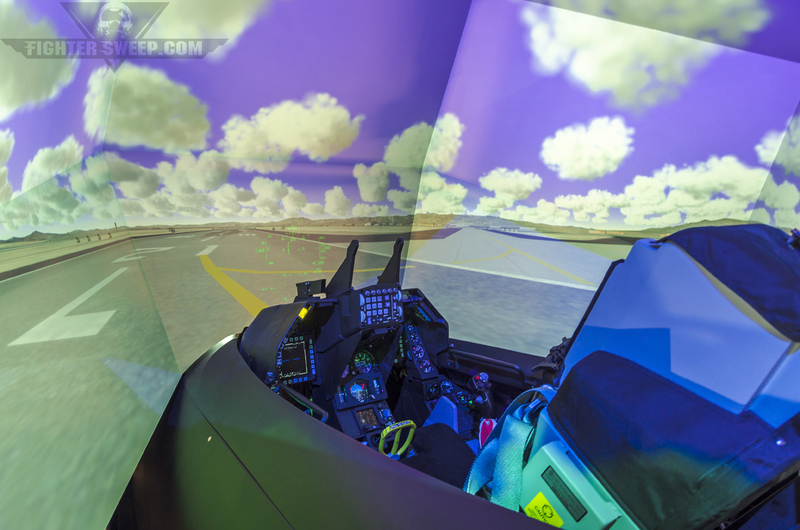 The “old guys,” as they referred to themselves all weekend long, also got inside Shaw’s state-of-the-art Mission Training Center, a 360-degree, high-fidelity F-16 simulator, getting their chance to actually get a feel for the platform carrying their legacy. 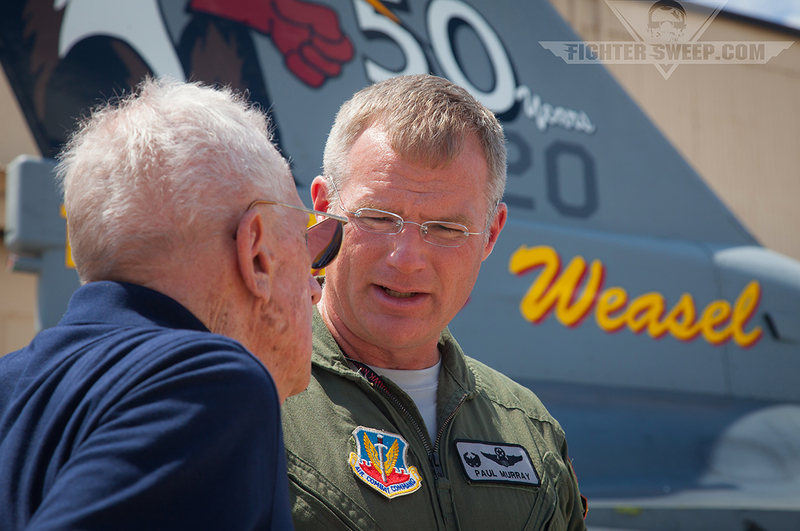 During the afternoon, the Wild Weasel 50th Anniversary tail flash, proudly designed by us here at FighterSweep, was revealed to the group, all of whom erupted in cheers and applause as they laid eyes on “Slapshot” for the first time. Of all the special moments from the weekend, seeing tears in a retired Weasel pilot’s eyes during the reveal was arguably the most fulfilling. Not to be outdone, Captain Craig “Rocket” Baker practiced his F-16 Viper airshow demonstration in front of the assembled Weasels, giving them a look at how agile the Viper is as compared to the F-100Fs, F-105Gs, and F-4Gs of yesteryear. All in attendance were awed by the gut-wrenching, high-G maneuvering and superior thrust-to-weight ratio the Block 50 has for a single-seat fighter. “I would have given up a [body part] to have had this Viper back [during Vietnam],” remarked Lamb, the very first Wild Weasel to kill a SAM site when the program was introduced in 1965. Between the sim rides, F-16 airshow demonstration, and getting their very own anniversary tail flash, the Weasels were in hog heaven. Even more amazing though was the turnout of the younger cadre of pilots, who were eager to talk with, to listen to, and to learn what their Weasel elders had to say. Also heard was the Wild Weasel motto, “First In, Last Out.” Though tactics and equipment have been modernized (the conference was designed to show the old guard the new tricks), the motto has stayed the same since the days of F-100s flying out ahead of a strike package, acting as “flypaper for SAMs” as once described by Lamb. Considering the proliferation of anti-aircraft systems and the widespread integration of air defenses, the need to seek out, suppress, and destroy these systems has grown increasingly relevant. Though no HARMs were fired in anger – since the Syrians played smart and left their radars off – the initial push on Night 1 of Operation Inherent Resolve would not have gone forward without dedicated SEAD support. It’s just as important for the USAF to celebrate its heritage, and the current cadre of Wild Weasels have stepped up to honor the legacy of the brave aviators that knowingly put their own lives in peril so that others would have a better chance of survival. We at FighterSweep want to do our part to help promote both current and retired Wild Weasels, and we plan to bring you more about the Weasels at 50. Later this year the Society of Wild Weasels will be hosting a reunion at the National Museum of the United States Air Force, where current and older generation pilots will once again gather to tell stories, compare notes, and honor their heritage. Once again, we at FighterSweep would like to thank the Society of Wild Weasels, the 20th Fighter Wing Commander, 20th Operations Group Commander, and the 20th Fighter Wing Public Affairs Office for the opportunity. Do The Chinese Have A Wild Weasel? Syria’s IADS: A Reason to be Concerned?